On its face, The Great British Baking Show, or as it’s known in the U.K., The Great British Bake Off, is nothing special. 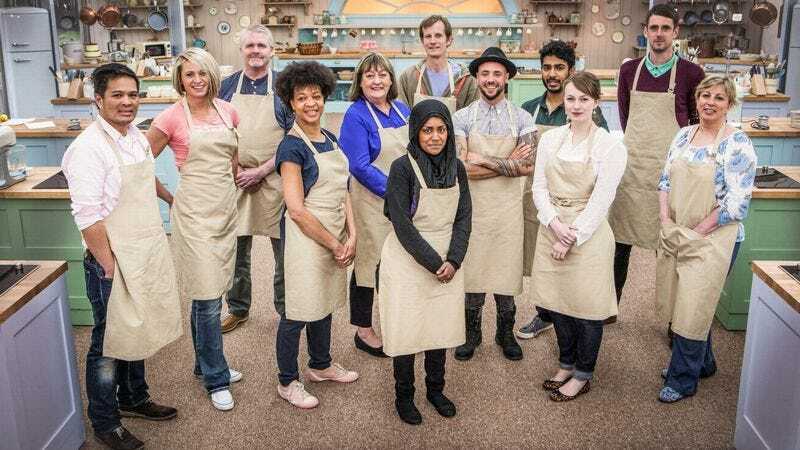 Each season, a new group of amateur bakers is brought to a tent in the picturesque British countryside to compete for the title of Britain’s best amateur baker, with contestants eliminated one at a time before a three-way final determines the winner. Television is filled with cooking and baking shows and at first glance, The Great British Baking Show looks like any number of them. However, this seemingly straightforward series is anything but: It bucks reality competition convention at every turn, espousing an uplifting, unquestionably humanist philosophy. Each aspect of the series is designed to prioritize great baking over easy drama, setting The Great British Baking Show apart from other reality series. Winners receive a cake plate and the title, but no monetary prize, weeding out applicants more interested in fame than their bakes. Contestants spend their weekends in the baking tent, but are sent home to their families during the week, which lets them recover, work their day job, and recharge for the next long weekend. Even the challenge structure stands out, with the bakers facing intense technical challenges that require the entire group to execute the same stripped-down recipe, their offerings judged blind. While these are canny and creative tweaks to a popular format, the most important aspect of the series is its ideology. The series has a distinct point of view, and it’s one worth celebrating. The Great British Baking Show presents—without hesitation or apology—an ordered and rational world. The challenges change week to week, but viewers and contestants alike can count on the fundamentals. There will be bakers in a tent, a series of themed bakes, and at the end of the weekend, a bittersweet group hug to wish the eliminated baker a fond farewell. The ovens will work as promised, each baker will have the supplies they need, and should something go horribly awry, hosts Mel Giedroyc and Sue Perkins are there for moral support, helping the unlucky baker get back on their feet. Rather than being thrown into random or unpredictable situations, the contestants are set up for success, with tools and ingredients they can rely on, letting them relax into their work and focus on the task at hand. The baking itself already contains loads of pressure—like whether the dough will rise correctly or the custard will set in time—and this is where the tension steadfastly resides on this show. Baking, like life, is challenging enough without fomenting chaos. That’s not to say the show takes it easy on the contestants. Judges Paul Hollywood and Mary Berry choose creative and often daunting challenges for the bakers and have high expectations for them. If you’re going to do something, they argue, it’s worth doing well, be it an intricate sugar concoction or simple biscotti. Both judges are honest with contestants who misstep, and wholeheartedly commend bakers who manage to successfully incorporate ingredients or concepts they were skeptical about. Even a seeming unsalvageable bake usually has a few aspects to recommend it, and Paul and Mary will find them. On The Great British Baking Show, every success or failure is met with thoughtful, detailed, constructive criticism, geared toward helping the contestants find even greater success in the future. Everyone can learn, the show contends, and massive failures often need only a small tweak to become stunning successes. Certain styles of baking lend themselves more readily to spectacle than others, but the show is rarely distracted by this. The series extends the same respect to a well-made family-style bread as it does a whimsical cake or dainty petit four. The moral is clear: Looks can be deceiving and substance comes in all forms. Who would expect a fire fighter, powerlifter, or prison governor to be among the contestants in a baking competition? Yet Mat, Ugne, and Paul (respectively) are just three of the bakers in the season currently airing on PBS. They may have little in common on paper, but passion dictates import. The more someone cares about something, the more interesting and compelling that thing becomes. Once we see how much the bakers love what they’re doing, the superficial differences that on first glance would define many of them slip away. We are more alike, the show argues, than we are different. While other reality shows pit their contestants against each other and craft villain narratives, and scripted dramas fall over themselves to explore the dangers of trusting others, here is a series that depicts the brightest sides of each of its bakers, even when they don’t quite believe in themselves. On The Great British Baking Show, if contestants are given the opportunity to do so, they will surprise even themselves. This unwavering faith, this belief in the decency and inherent kindness of other people is painfully underrepresented on television right now. The Night Of may center on a compelling mystery, UnREAL on two fantastic lead performances, and Mr. Robot on a fascinating central character. But at the core of The Great British Baking Show lies hope and genuine belief in the goodness of humanity, and I’ll choose that every time.